FusionFall is doing a fun "Spring Fling" event! "Hop" into the game and look for the hidden Spring Chickens. They will give you access to a special dungeon filled with Coco Eggs, and some of those eggs contain special surprises. 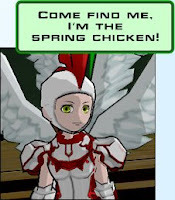 Free players can find one Spring Chicken in the future zone, and premium members will find many more in the past. I know of at least two cool items that will only be available for a limited time, so start hunting! EDIT: Oops, this event starts tomorrow, gang! Play Classic Sierra Adventure Games!